The camper vans for hire in Berkshire are from a range of locations. Our VW rentals operate from Maidenhead, we have a couple from Wokingham and also hire campers in Reading. Whether you are based in Windsor, Bracknell or even Newbury locate a van from the listings below and send an enquiry. Berkshire vw campervan owners can be contacted using the enquiries forms on their van pages. I am Bella, hire me today! Bella the Campervan . Based in Berkshire/Surrey borders available for your wedding. All inclusive starting at £350 for your wedding day. 2016 VW T6 with brand new conversion to high spec with lots of cupboard space, Flat Rib bed, Huge top loading fridge. Pop top sleeps 2. Front seats turn to seat 4 people with main and side table. Fantastically converted early in 2014 to an extremely high standard. He drives wonderfully and is in his element when near the sea. It all bodes well when you hire Bodhi! 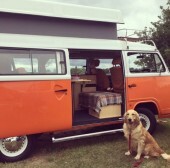 Matilda is our 1974 aircooled VW T2 Westfalia van. She has recently been fully restored and is now available for chauffeur wedding hire. Please note - Matilda is available for wedding hires only!